Hasn’t cooking gotten complicated in recent years? I blame the internet. Endless inspiration can be found there, but also endless competition. The simple meal has lost its dignity, and it is a shame. Fewer ingredients (which means less planning, shopping, money, storage, and management), less time, and less effort– how can that not benefit a busy mom, esp if she dislikes cooking? Chicken-in-a-Pot has become a mainstay in this household. I love it not only because it’s good and good-for-you, but it fulfills a rule of minimalism: things should have more than one use. No one should leave home without learning how to make this and how to use it. A few quick minutes of throwing things in a pot will get you the base for two or three meals. 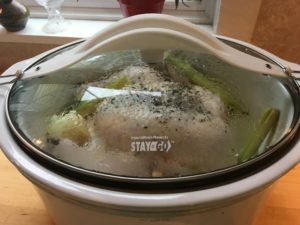 My favorite method is the good ol’ Crockpot. However if you search online, you will find many other ways to make this french classic. Throw in a chicken (or two, or three. I figure one chicken per four people). Add a couple stalks of celery, a quartered onion (leave the peel on for color), a few garlic cloves, and maybe a handful of baby carrots. Sprinkle a little seasoning on top; thyme or sage is good but it can be as simple as salt and pepper. Then put a couple inches of water or broth in the bottom. If you want to be fancy, you can add a little white wine. It is pretty hard to mess up. Cook it on low overnight or for the whole day. You want the chicken to get soft and juicy. If she looks pale and stiff, you need more time. The leg bones should wiggle very easily, like they’re about to fall off. *Pull the meat off while still warm. Use it for chicken salad, green salad, quesadillas or other Mexican goodies, pulled bbq chicken, chicken deli sandwiches, or chicken-rice casserole. I have also chopped it and added it to a couple Asian salad kits. You could do the same with some Caesar kits. *Don’t try to get every scrap of meat off the carcass. Put the carcass back in your pot of broth and add more water to cover. Simmer overnight for a pot of rich bone broth. *Now strain and salt your broth (adding back carrots if you had them) and make a pot of noodles to add for chicken-noodle soup. Or use the broth for any number of soup recipes. One favorite here is Chicken-Wild-Rice Soup, recipe coming soon. . .
*Another thing you can do is add a can of cream soup before you cook and it will turn into a creamy gravy. Cut some tortillas into wide ribbons and drop them into the pot about an hour before your chicken is done. You will have a simple pot of chicken-and-dumplings. *Easiest of all, just put your pot of chicken out to eat as-is. Mashed potatoes are great with it or well-buttered steamed red potatoes. With enough salt this is the finest of comfort food and fit for a king. Don’t hesitate to serve it to company. The moral of the story is, always keep a chicken or two in the fridge.